Marshmallow Supernova: Why Transformers 3 is the worst film ever made. We open with the Autobots helping the Americans to infiltrate a Middle-Eastern country (assumedly Iran) and blowing up a military base for the crime of developing nuclear capability and not being American. Take that, terrorists! Sorry, 'legitimate foreign government'. Of note is that there is literally not a note of criticism in this at all. The Autobots don't take a fall for acting as World Police, this is another 'punch the air at the exciting opening' moment. Yeah! Autobots helping America police the world! Yeah! USA! USA! All that scene was missing was after levelling the foreign base, Optimus Prime sticks a straw into the ground and starts sucking out all the oil. What else does Optimus Prime do? He lets the Decepticons take over a city, murdering all the inhabitants in order to "teach the humans a lesson." Yes, he could have just stopped the Decepticons first, but then the humans wouldn't have realised just how evil the Decepticons were, and might not have liked the Autobots so much. Surely the priority should be stopping the villains from mass-murder, not holding back so you can waggle a finger and be all 'nya-nya, told you!'. We have a scene in the film where a Decepticon executes a helpless prisoner, to drive home the fact that they are evil. At the end of the film, when the villainous Sentinel Prime is lying before Optimus, disarmed and begging for his life, Optimus Prime raises his gun and shoots him in the head, execution-style. Megatron, who moments before, saved Optimus's life, walks up to him to declare peace, and without warning Optimus Prime rips his spine out. (In the original draft of the movie, they part company, and Megatron leaves to rebuild Cybertron in space. Apparently that wasn't exciting enough). There is no critique of any of these actions. None. It's all completely straight-faced. Apparently the execution of prisoners and the sacrifice of civilians in an 'ends justify the means' scenario is just another thing the modern hero has to do. It's a celebration of the post-911 US military machine, which given this is a Michael Bay film is not surprising. This is not the Optimus Prime I grew up with. This is not some paragon of virtue and nobility against the darkest odds. This is literally a war criminal who would be at home running Guantanamo Bay. I use the word 'literally' here in its uh, literal meaning. If this was a film with humans instead of robots, you would expect the main character to finish it in chains at a court martial. The worst thing is, this is more of a fridge horror. The movie is so adapt at 'punch-in-the-air exciting moments' that it is only later that you realise "hang on, what I was watching and cheering on was awful!" The entire moral baseline of these movies is that such behaviour is completely normal, and the worst thing is, the audience doesn't even realise. Of course, we live in a world where the government can indefinitely detain people without trial and spy on anyone for no reason or oversight whatsoever. Fifteen years ago that seemed like some 1984-esque insane nightmare. Nowadays people just shrug and accept it as a fact of life. Terrifying. In the films though, this militaristic behaviour doesn't terrify, and that's what is scary. A beloved children's hero is turned into a war criminal, and people barely seem to notice or care. Why should we care though, it's not real? It's not real, no. But it's what we get our entertainment out of. We get our entertainment out of cheering on some sort of robotic amalgamation of George W Bush and Bin Laden, whooping as he blasts another helpless prisoner in the face. It should worry you. It should make you kick and scream every time you are told that this is how the world should be, and that this is the good and right and proper way the world works. It's not real, but you wouldn't accept a heroic film about Hitler, or Pol Pot. I genuinely cannot think of any film where the hero goes around executing helpless prisoners with not even a word about how this might actually be a little bit wrong or the slightest hint of remorse. Popular, mass-entertainment like this with crooked morals normalises such behaviour. It's not as shocking in real life as we see our heroes, those we aspire to be, doing it. The 'terrorist' comparison is valid too. 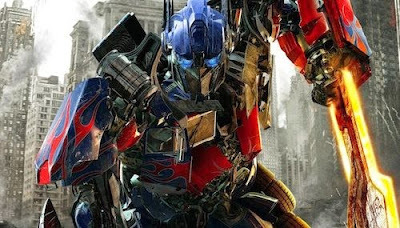 Optimus Prime and his band of 'freedom fighters' seem only to want to destroy the entirety of Cybertronian life. In the first film, Prime's actions result in the destruction of the Allspark, which is the only thing that can bring life to their dead world. In the second film, he destroys the Matrix (which is (again) the only thing that can bring life to their dead world) and the sun collector (which (again, again) is the only thing that can bring life to their dead world). He compounds this in the third film by shearing Cybertron in half, and not even commenting on it. If I was a robot, sitting at home, watching the newsflash on the television, I know who I'd be rooting for. And it's not Optimus Prime. If you want to have your heroes do ultra-violent things for whatever reason, at least give them no option. For all the bile against Superman killing Zod, he didn't have much choice. It's not like Zod was in front of Superman, bleeding and defenceless, begging for his life. He's not like Optimus Prime. The writers actually went to the effort of making it a no-win scenario (though the question of whether they should is another one entirely!). For all that, I would have been okay with the films if that was the point, if Optimus Prime was called out on his dreadful behaviour, if he was made to pay for basically being a war criminal. But he's not, because in the world of Michael Bay, this is good, justifiable behaviour. Just like every decision the US has made in the name of 'patriotism' and 'freedom'. And he made sure that the audience agreed with him. And he did it with one of my childhood heroes.